College Hill Arsenal is your source for the finest in Civil War era & antique arms, as well as fine military arms from the Colonial period & Revolutionary War through World War II. College Hill Arsenal is the outgrowth of years of personal research and collecting in the field of Civil War small arms. What started as a hobby for me many years ago has become a business. Over the past few years we have significantly expanded our inventory and the eras and types of military and collectible weapons that we carry. I started out primarily as a collector of American Civil War infantry arms, especially imported arms used by the North and South. I will always try to specialize in that area. I try to keep a high quality assortment of muskets, rifles, bayonets and related items for sale at all times. As a collector, I always tried to purchase the finest examples of items that I could, and that philosophy has carried over into the business. I try to only buy inventory items that I would be proud to have in my own collection. The best part about this as a business is that it allows me to carry inventory in areas in which I was always interested in, and passionate about, but my collecting focus kept me from pursuing. Now I am very pleased to offer many of the unique and interesting handguns of the Civil War era, as a compliment to the long arms. Our expanded inventory includes a wide range of edged weapons and militaria from the Revolutionary War era through World War II! I have a particular interest in edged weapons including the bayonets and fighting knives of all of these eras, and work actively to purchase and offer many fine, unique and scarce examples of these arms. I am always buying (single items or whole collections), selling and trading, so please do not hesitate to contact me via phone or e-mail to discuss items that you want to purchase, sell or trade. I also attend a number of the national and larger regional Civil War & Military Shows during the course of the year, so you can always check our Show Schedule page to find out if I will be set up at a show near you in the future. I try to average at least two or more shows per month, to make it easier for my customers to see my inventory in person. My years of experience as a collector and dealer in antique military arms has allowed me to be the contributing author to two major works on Civil War era arms: The English Connection - Arms, Material and Support Furnished to the Confederate States by Great Britain (2014) and Confederate & Southern Agent Marked Shotguns (2017). 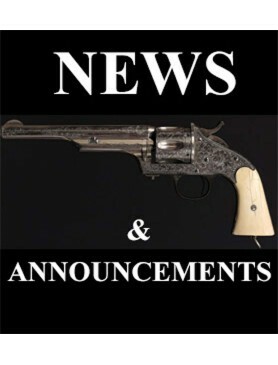 I have also authored numerous articles regarding Civil War military arms and also author a monthly column in Civil War News on Civil War weapons entitled Inspection - ARMS! Since Season 21, I have been a featured appraiser in the field of Arms & Militaria on the PBS television series Antiques Roadshow: Antiques Roadshow Militaria Appraisers. I hope you enjoy browsing the site and I look forward to hearing from you soon.